Drug use peaks in the late teens and early 20s. It’s a time of change, with opportunities for independent living and decisions. Entry into higher education and careers offer new social networks, identities and freedom from parental control. Physically you’re at your peak. It would be a great time to have lots of expendable money to spend on life’s little luxuries. But it’s a time when most people are not that flush with cash. Money for most, needs to be spent wisely. It’s with this in mind that GDS2019 is revisiting the notion of value for money (VfM) for the first time in 5 years. The last time we asked this as part of GDS2014, cocaine was the worst value for money drug in world with a mean score of about 3.4/10 compared with the highest-ranking drug, MDMA powder, coming in at 7/10 (see table below). There was marked country variation as you’d expect, cocaine scoring highest in Belgium with a score of 5.5 and lowest in Australia at 2.3. For MDMA pills, the Netherlands topped the VfM stakes at 8.2, with New Zealand at 4.2/10. But 5 years on, the world of drugs and especially their purity has changed. We suspect that this has not only impacted on use, pleasure and harms but also on perceived value for money. 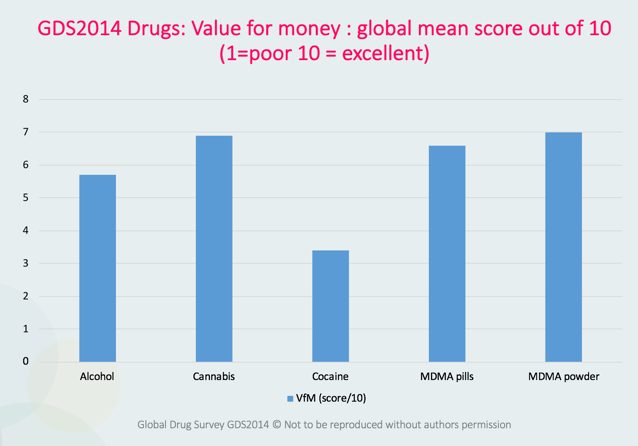 In GDS2014 we only explored VfM for a few drugs – this year we are doing it for 10, including LSD, heroin and ketamine, and differentiating between alcohol bought in shops versus that bought in a bar or pub. So, this year we want your help in answering this simple question; how do you rate the drugs you use in terms of value for money?